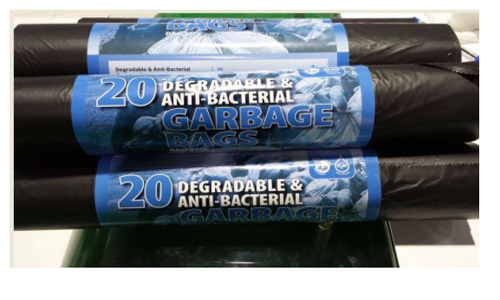 Silex Trading in the UAE have developed plastic garbage sacks which contain Symphony’s d2w (oxo-biodegradable) and d2p (anti-bacterial) technologies in the same product. The new product was introduced at the recent Arabplast exhibition in Dubai (10-13th January) and was very well received by visitors from many different countries who recognised the benefit of combining these technologies. Whilst in use, the garbage sacks will combat bacteria which cause unpleasant odours and attract flies, and in the event that the sack escapes authorised disposal and ends up in the open environment, it will convert into biodegradable materials and will safely biodegrade. These sacks are not for composting and are not intended to degrade deep in landfill. Symphony’s d2w oxo-biodegradable technology is approved by the Oxo-biodegradable Plastics Association (OPA) and has recently been awarded the coveted ABNT Eco-Label, confirming the environmental credentials of the d2w additive, and distinguishing it from all other oxo-biodegradable products on the market. Symphony Environmental Ltd is a British public company dedicated to finding technical solutions to the world’s environmental and public health problems by making plastic smarter. Symphony has also developed anti- counterfeiting technology for plastic products and plastic packaging to help brand owners protect themselves from attempts to sell copies of their products as genuine. ICA, API and SACMI, the Italian trident develops a 100% biodegradable & compostable capsule for hot beverages.